My writer friend Michael A. Burstein sometimes writes for The Jewish Advocate, which is the local Jewish community newspaper in Boston. He is also a regular attendee of Arisia, so he pitched an article to the Advocate regarding the Friday night davening and the new siddur, and he interviewed me for it. The article made the front page of this week’s paper (! ), but like all their digital content, it’s behind a paywall. (Boston locals please note: If you’re not an Advocate subscriber, you can still pick up an individual copy at the Israel Book Shop in Brookline… if the snow emergency ever ends!) So rather than the article itself, I give you the (slightly edited) text of my interview answers instead. How do you identify your Jewish observance or affiliation? Have you attended Arisia before? I believe my first Arisia was in 2000. I attended every year (maybe missing one) between then and 2014, which was my last Arisia before I got married and moved back to my native Indiana. Were you ever part of Friday night services before? I started regularly attending Friday night services as a student at Brandeis University in the early 1990s. I later moved to Cambridge and joined Temple Beth Shalom (the Tremont St. Shul), and by the early 2000s, I was leading an egalitarian Friday night service there every week. Arisia 2007 was chaired by my good friend and fellow congregant Joel Herda, and also moved for the first time to the Hyatt Regency Cambridge on Memorial Drive (where it was held 4 times). Since most of our regular Kabbalat Shabbat minyan was going to be attending Arisia that Friday night, and especially since it was practically in our backyard, I decided it would be awesome to lead a spinoff service right at the convention. Once or twice previously I had attended a minyan at a con (Lunacon in Rye, NY), and they were usually quite perfunctory and quite Orthodox — such that I didn’t feel very welcome or encouraged to participate. I wanted to create a space that was more inclusive and more expressive, and would help bring our Jewish-geek community together to celebrate Shabbat at the beginning of the con. My friends and I borrowed a crate of prayerbooks from the Tremont St. Shul, posted flyers around the convention on Friday afternoon, and held the service in Benjamin Cline’s hotel suite living room. The way the Hyatt is set up, all the suites have balconies that open out onto the central atrium. I led the service, and we opened the doors and you could hear our singing all throughout the atrium. It was beautiful and one of my most cherished Arisia memories. We were hoping to scrape together 10 people to make an egalitarian minyan that year. We got close to 20 people. The last time I was there, in 2014, it was over 35 people (crammed into Terri Ash and Matthew Barr’s hotel suite). This year, they reported 42 people. So it’s been steadily growing. 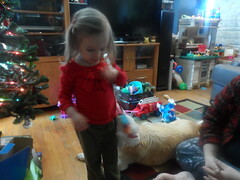 It’s become something a lot of people look forward to year after year. Merrillville, Indiana, in the northwest corner of the state, about an hour from downtown Chicago. I grew up in this area (two towns over in Valparaiso). Incidentally, I now lead the monthly Friday night service at the only Conservative synagogue in the region, Congregation Beth Israel in Munster, IN, where we are members. When was the last Arisia you attended? How did you get the idea of developing a siddur for the Friday night services at Arisia? Since I moved away, the service has been organized by Terri and Matthew. One of their innovations for Arisia 2016 was to obtain Arisia programming space so that the service could be held in a public area of the convention, so there’s more space and also more visibility. In November 2016, Aaron Block raised the idea of a “pamphlet-style siddur” that could be stored from year to year with the Arisia materials, so that as our numbers kept increasing, no one would have to schlep heavy crates of full-size siddurim from Tremont St. ever again. For purposes of inclusiveness, it was important to us to have full transliteration, as well as full Hebrew and English, of a complete traditional Kabbalat Shabbat and Ma’ariv service. We weren’t aware of an existing one that would meet our needs, so, of course — we’re geeks — the solution was to build our own. I drew heavily on the textual resources available for free from the website OpenSiddur.org, without which this project would have been impossible. I created it in Adobe InDesign over the course of several weeks. I uploaded the finished files from my home computer in Indiana to the FedEx Office shop in Coolidge Corner, and Terri was able to pick up the printed booklets a few days before Arisia. Who does the prayer book honor? What is the significance of the cover? We chose to dedicate the project in honor of Leonard Nimoy z”l, whom we lost in early 2015. The cover art is instantly recognizable to most con-goers as the Vulcan salute from Star Trek, but it’s also the gesture that the cohanim use to bless the congregation, with the hands held to form a letter shin. That was purely Nimoy’s Jewish influence — it was his own idea to adapt that gesture for the show. Represented in this setting, it makes for a nice visual double-entendre (so to speak). 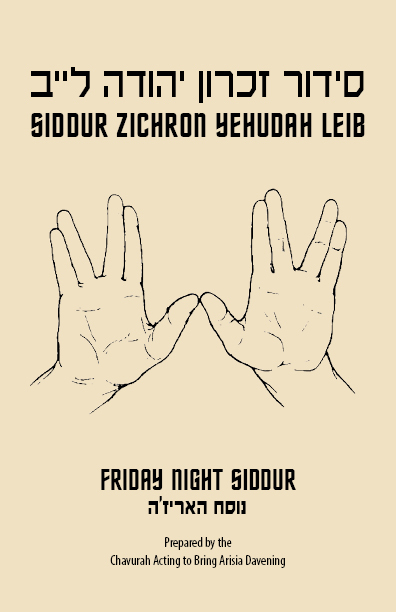 What do you think Nimoy would think about this siddur? I hope he’d find it a cool project, but I suspect he’d be surprised to find himself the honoree! I’m not sure he would have felt himself a role model for a religious community, necessarily. But he really is a treasured icon in the Jewish geek community — and most particularly in Boston, of which he was a native. So it seems like the intersection of all those circles is his rightful place. Arisia as a whole seems to be committed to respecting diversity. Do you feel that Arisia is supportive of Jewish observance at the convention? Can you give examples? From what I have seen, yes, I perceive that Arisia as a corporation is sensitive to religious needs as well as supportive of diversity. For instance, they have a “Shabbat block” of hotel rooms that are reserved on a low floor accessible by stairs. In my observation, geek culture — while it stands up for diversity in general — tends to stand a bit in opposition to religiosity as such. Religion and religious devotion can be, to put it bluntly, seen as suspect. You might get some religious Christians at a SF/F convention, but not very many. But culturally, Jewish observance seems to get a pass. It’s OK to be deeply religious at a con as long as it’s Jewish. People accept it more easily. I don’t know if that’s because Judaism is non-proselytizing (so it feels safe to be around), or if it’s inherently a “geeky” religion prone to pedantry so it’s something fellow geeks can make sense of.